Climbing mountains with others builds camaraderie and cohesion unlike anything else. This is true even on easy climbs – the ones that are more “walking” than “climbing” and don’t require ropes and harnesses. 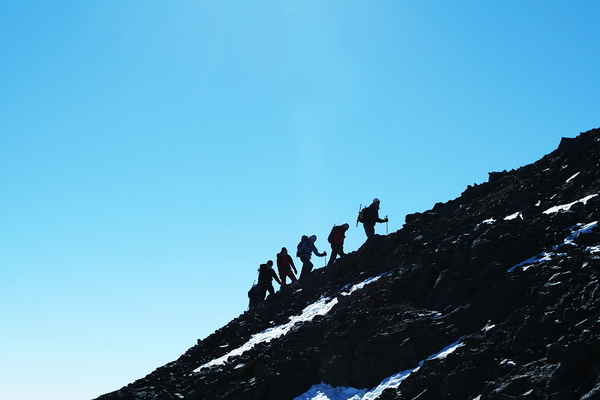 For this reason, mountain climbing can be the ideal team building activity. Sometimes the best team building happens away from the normal place of business. Planning and executing a climb has several parallels with achieving lofty business goals. In both instances, a team aligns to tackle a big job, and then works hard to reach the (real or metaphorical) pinnacle. Both tasks incorporate ambiguity and a certain amount of risk, and though a positive outcome is expected, reaching that outcome may involve overcoming various obstacles through teamwork. When you and your group are climbing a mountain, weather, illness, and other factors may interfere with a straightforward hike to the top. In business, market changes, new competitors, or technological breakthroughs can alter your team’s path. 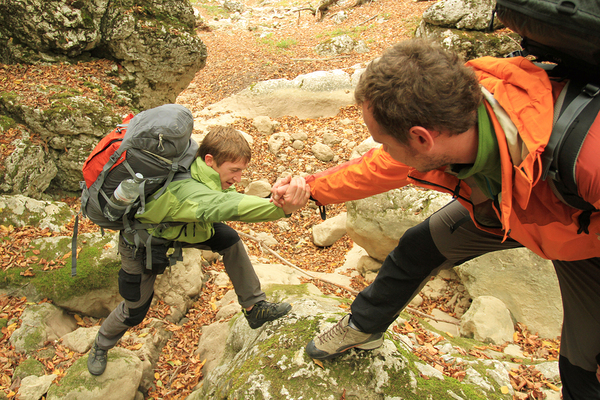 The parallels between climbing and successfully running a business can be striking. Here’s why team building is remarkably effective at 10,000 feet. Climbing a mountain, even in the company of a group of people, is a meditative process. Your muscles are doing the work and your mind has a break from the normal demands made on it, like a constant stream of text messages, emails, and other office-related distractions. It’s very hard to find that level of calm in a work setting, or indeed most places outside of nature. A team building hike up a mountain gives everyone a different perspective. Not only do you see your colleagues outside their “normal habitat,” you have a chance to pick up on entirely different cues than usual, and discover qualities your co-workers have that you may not have known about. Working with teammates in a different context can open up many new insights. The ascent up a mountainside can be seen as a representative of the achievement of the business goals your team pursues back at the workplace. The team building aspect comes from the need for everyone to use their skills to help overcome the obstacles inherent in any trek. Naturally, you prepare well, and go into it with a positive attitude, but team cohesion and learning happen when each team member is ready to handle whatever the adventure has in store. You can reach surprising conclusions about your colleagues that may never have become evident at the office. A degree of flexibility is required in climbing a mountain that isn’t necessarily part of other types of team building exercises. While you need a plan, what you don’t need is dogma. Climbing is a perfect opportunity to discover that original plans are good, but they aren’t always the best plans, and as the team learns from the adventure itself, the plan can be improved along the way. Think of your plan for mountain climbing as a general map rather than as specific, turn-by-turn directional guidance. You may have to deviate a bit from your plan, but it can still continue to guide you toward your goal. While there is no substitute for commitment and determination in reaching a business goal, sometimes the best strategy includes time to step outside what’s normal and tackle a new challenge together as a team. What you’re doing is not wasting time, or giving up, but rather adding a new perspective, one that can ultimately help the team function at a higher level than it could have otherwise. I invite you to get in touch with me to find out more about booking a speaking engagement. I would be more than happy to hear from you.